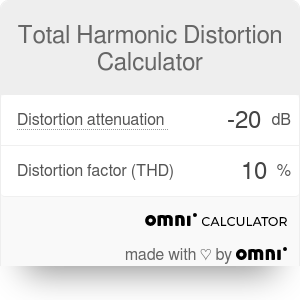 Total harmonic distortion calculator helps you switch between distortion attenuation in decibel to distortion factor (THD) as percent value. Total harmonic distortion parameter is important because it directly influences the sound accuracy. In the article below, you will read what is total harmonic distortion and about the total harmonic distortion calculation. Total harmonic distortion (THD) is a parameter measuring the harmonic distortion present in a signal. It is defined as the ratio of the sum of the powers of all harmonic components to the power of fundamental frequency. In audio systems, lower distortion means that the components (speakers, microphones, headphones, amplifiers) produce a more accurate reproduction of an audio recording. THD factor compares input and output audio signals, with the difference in levels measured as a percentage. All you need to understand is that the percentage represents the harmonic distortion or deviation of the output signal - lower percentages are better. An output signal is a reproduction, not a perfect copy of the input, especially when multiple audio components are involved in the audio system. Accuracy of the sound is disturbed if the Total Harmonic Distortion has increased over a certain point. The root of these disturbances are unwanted frequencies which occur in the output signal, but they are not present on the input. Simplifying - harmonics distortion is added to the original signal. For example, THD of 0.1% means that 0.1 percent of an output signal is false, and contains unwanted distortion. In reality, it is hard for a human ear to perceive THD, especially when it is only a small part of a percent. If you can't consistently hear half a percent difference, there's a low probability that you will notice a THD rating of 0.01 percent. Every signal processing component adds some level of distortion. Small differences in THD from one brand of a component to another can be significant and may define audio signal quality. Nonlinear distortions are given as Total Harmonic Distortion (distortion factor k) in percent or as distortion attenuation (ak) in decibel (dB). THD itself is defined as the ratio of the sum of the power of all harmonic components to the power of the fundamental frequency. The distortion factor is always smaller than 1 or less than 100%; consequently, distortion attenuation has to be a negative dB value. distortion attenuation: ak = 20 * log (k/100) in dB (input k in percent). distortion factor THD: k = 10^(ak/20) * 100 in % (input ak in dB with a minus sign). Also, if you would like to know how sound propagates in the air - click here. Total Harmonic Distortion Calculator can be embedded on your website to enrich the content you wrote and make it easier for your visitors to understand your message.